Investigation into microbial communities, viruses, and other microorganisms is central to marine biology. Bacteria make up 98% of the ocean's biomass and plays a central role in the ocean's ecosystem. Marine microbiology is now more important than ever as a means to understand the relationship between various organisms in the ocean and the effects of climate change. Microscopy is fundamental to studying the tiniest organisms that make up such a vast portion of the ocean's environment. 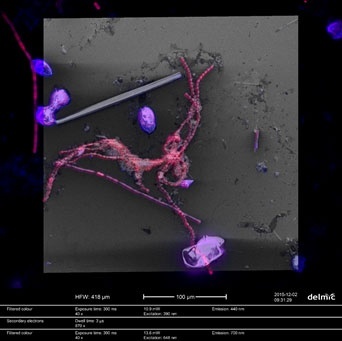 Correlative light and electron microscopy (CLEM) provides a new dimension to the study of marine microorganisms by offering a simultaneously more holistic and detailed picture of microorganisms at the nanoscale. Biodiversity is one of the central topics in the field of marine microbiology. Combining a fluorescence with an electron microscope enables the researcher to study the relationship between different organisms and viruses in the marine environment. CLEM also opens up new possibilities such as the in-depth investigation of thin sections. Figure 1: Overlay of fluorescence and electron images of microbes in the marine environment. 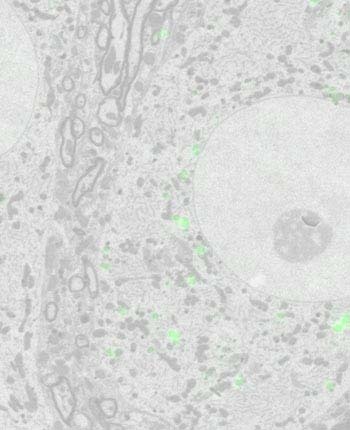 Highlight regions of interest with fluorescence microscopy (FM): distinguish easily between different communities in your sample. 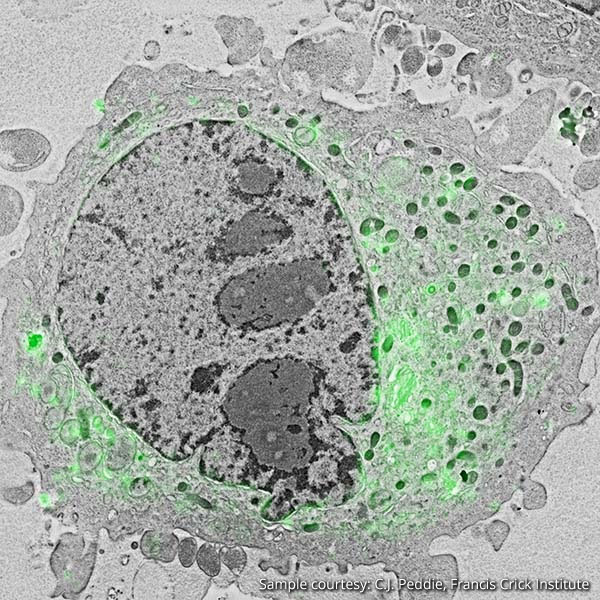 Obtain contextual and ultrastructural information with the electron microscope (EM): for optimal characterization of microbes. Acquire two types of data at different scales simultaneously: for highly detailed contexual information. Figure 2: Dolichospermum (aka Anabaena) (round) and Aphanizomenon together with dinoflagellates and a diatom from the Baltic Sea. This sample was taken June 2015 from surface water close to Askö (Sweden) by Niels Schoffelen and Daniela Tienken (MPI Bremen). 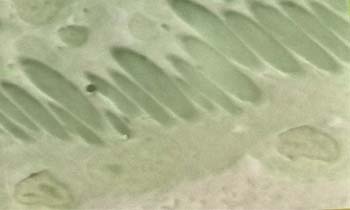 Direct observation has always been and remains a solid method for the study of microbes in marine microbiology. This began with light microscopy, when scientists observed plankton and cultured microbes. 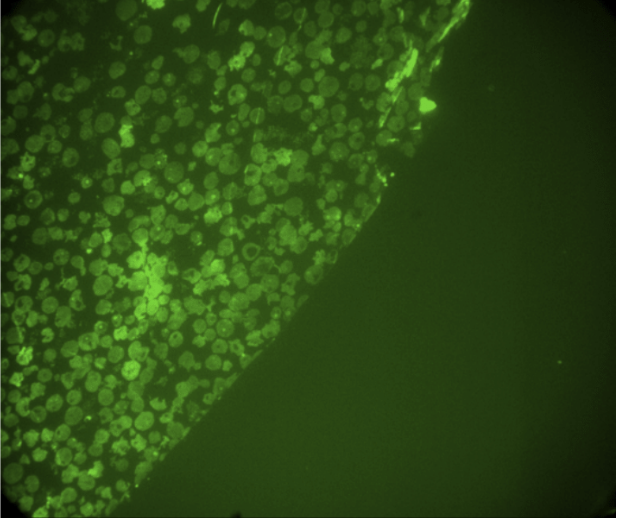 Eukaryotic cells are often large enough to be observed with a simple light microscope, and this method has proven useful for classification and enumeration purposes in the observation of marine samples. 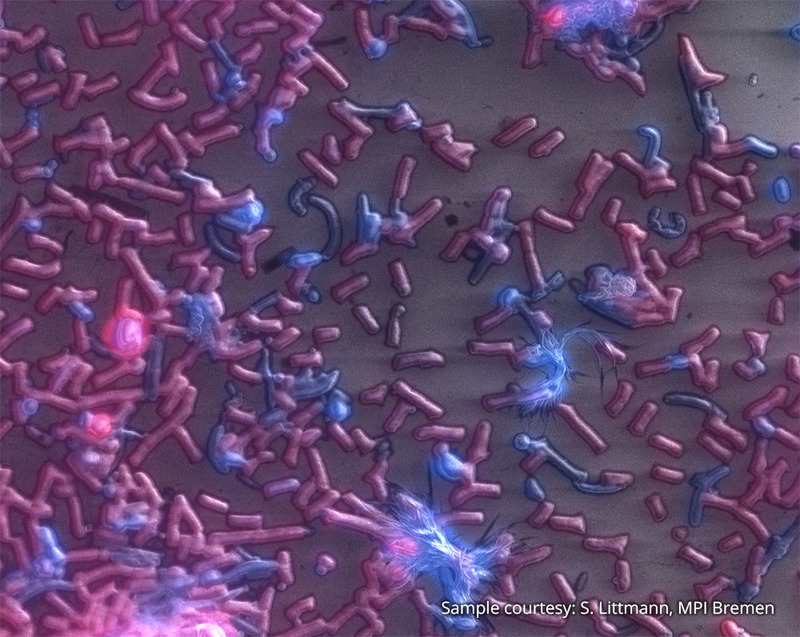 Fluorescence microscopy enables more in-depth studies of microbes by illuminating specific regions of interest. Given that the majority of marine microorganisms autoflouresce, this is also the most logical and simple consideration as a first step in observing the microenvironment. Incidentally, green flourescent protein (GFP) - now commonly used for expression in fluorescence microscopy - was first isolated from the jellyfish Aequorea victoria in the 1960s. Major discoveries about the sheer volume of plankton inhabiting our oceans were made using fluorescence microscopy. This led to new insights regarding the importance of plankton in the marine environment. Nevertheless, as our understanding of the marine environment deepens, so does the necessity of technology which can obtain data at a higher resolution. For this reason, the use of an electron microscope has become prevalent as a means to observe microbial communities at a scale smaller than the wavelength of light. A scanning electron microscope scans the sample with a very fine beam of electrons, which offers detailed images of the surface structure of microbes. However, it is also useful for studying other phenomena occurring at the nanoscale, such as microbial movement and the relationship between marine microbes and protists. Viruses are also extremely abundant in marine environments, and they are too small to be detected by a light microscope. CLEM enables the tagging of microbes, viruses, and other regions of interest with FM while also acquiring structural information at the nanoscale with EM. Reference: Munn, C. (2011). Marine microbiology. Garland Science. Understanding the dynamics of marine environments means understanding how microbes, protists, and viruses relate to one another. 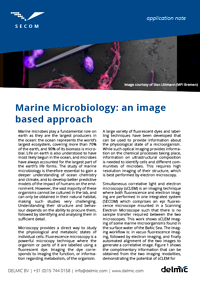 This makes CLEM an ideal tool for marine microbiologists; combining the labelling power of FM with the highly detailed contextual information offered by EM. FM serves to illuminate specific regions, while EM reveals the whole picture and the morphology at a nanoscale resolution. The SECOM, an integrated CLEM system, enables the scientist to obtain two different types of data simultaneously. 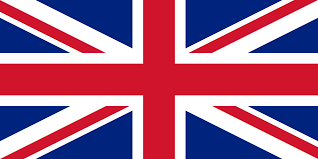 There are thus no changes to the sample between measurements and the data can be overlayed with complete accuracy, requiring no intervention from the researcher.